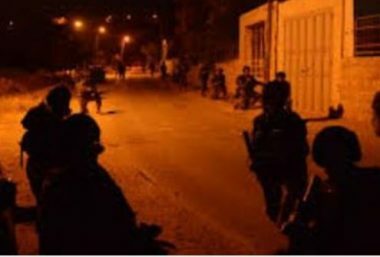 Israeli soldiers invaded, late on Wednesday at night, Qabatia town, south of the northern West Bank city of Jenin, and abducted one Palestinian from his home. The soldiers invaded and searched the family home of a young man, identified as Ahmad Abu ar-Rob, and abducted him, before taking him to an unknown destination. The soldiers were also heavily deployed on roads around many villages and towns in the Jenin governorate, and installed many roadblocks, before stopping and searching dozens of cars, and interrogated many Palestinians while inspecting their ID cards.